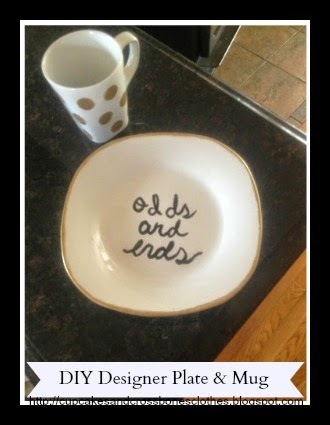 DIY Designer Plate & Mug For Pennies! I am a sucker for home decor and lately I have been loving the whole gold trend that has been going on for quite some time now. My most recent find that I have been totally head over heels for has been Kate Spade's gold accented decor. Specifically their polka dot can cup and their "odds and ends"square dish. Even though I did fall in love with them, I was not willing to spend a total of $80 on both (Can cup=$37.99, Plate=$40.00). So what do we do when we don't want to spend a fortune yet still accessorize with these items? We make our own of course! -Squirt a little black paint onto one section of your paper plate and then put some gold paint on another section of your paper plate. -Make sure your white dollar store plate is completely clean and dry. -Don't worry if you make a mistake because if you wipe it up right away with a wet paper towel, the paint should all come off. Remember too, this plate was made to look like it was handwritten and not perfect so get wild with it! -Paint the edges surrounding your white plate gold. You may need to do about 3 coats to really get it nice and solid. -Once the gold paint is completely dry, use the back of your paint brush to scrape up the inner edges to make them a bit more straight and neat. -Let your plate dry and place it by the door to hold keys, or use it in your room on your night stand to place little "odds and ends"
*Do not use this plate to eat off of. It is for decoration purposes only. -Place some gold paint in your paper plate. -Make sure your mug is completely clean and dry. -Use your circular sponge brush and dip it in the gold paint making sure to coat the entire circular part of the sponge. -Dab the excess onto the plate and then press the sponge onto your mug making sure the whole sponge presses against the mug. -Repeat the last step randomly around your mug until you are satisfied with how it looks. -Place your mug on a cookie sheet and put it in the oven at 350 degrees for 30 minutes. 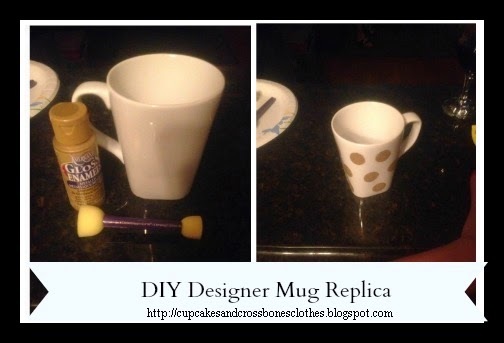 -Use hot mitts to take your mug out and let it cool off. *I would recommend hand washing only. I had this paint and the brushes on hand already, so in total this project cost me $2 , rather than $80. I believe the gold medal for savings goes to me if I say so myself! What are some items that you would love to recreate for your home? 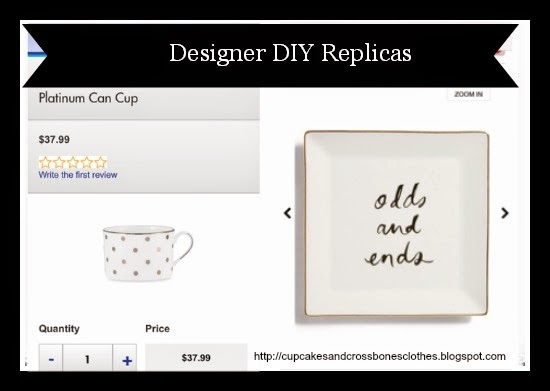 Do you often find yourself replicating items that you find in the stores that are a little too pricey that you know you can DIY for way less? these have been some of my most-requested christmas presents. they're so cute! They are so adorable and when you DIY you can always add your own custom touches. Best part is that it's quick, easy, and super inexpensive! How cute! I'm like the least crafty person on the planet but I think I could do this! They'd be perfect as food props for photos! so cute! i am with Kels, I am zero creative haha. Thanks! You got this girl...super simple! So cute. I love being able to make my own and customize it. Thanks, it was fun creating it. This looks so cute! I love little dishes for catching jewelry and other odds and ends. Thanks girl! I'm telling ya, it is so perfect. I keep it right on my nightstand and it is great for everyday jewelry I take off before bed.